I've always loved pasta, especially with seafood. The textures and flavors go so well together. It's especially good with some added spice, like Seafood Pasta Diavolo! 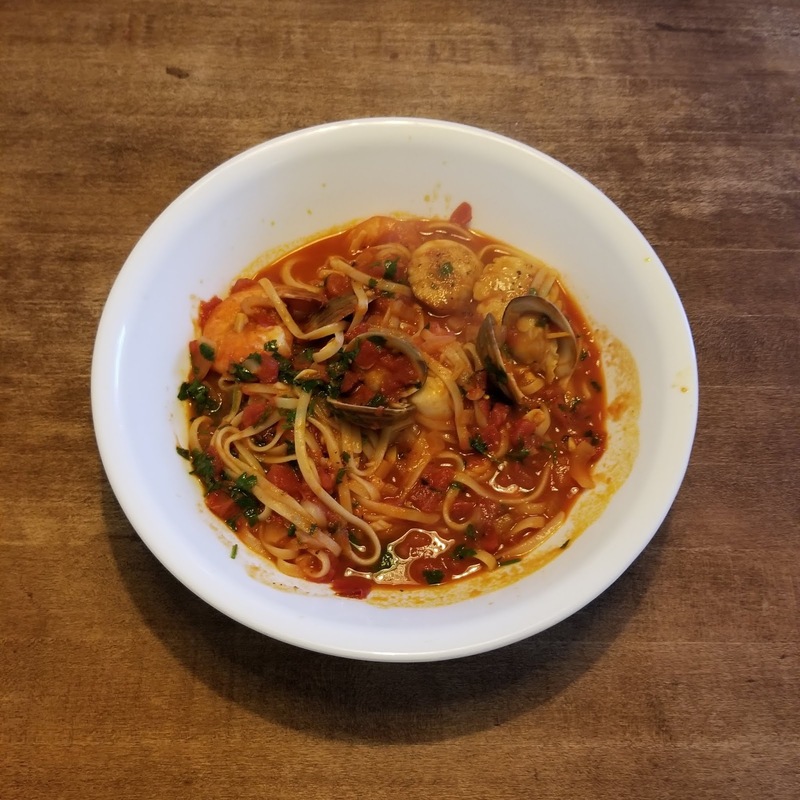 Diavolo sauce, or fra diavolo sauce, is typically a tomato based sauce with some red pepper or other spice added to it to give it some heat. To start, heat the olive oil over in a skillet over medium-high heat. Season the scallops with salt and pepper. Pan sear the scallops for about a minute on each side, until well seared and golden brown. Remove the scallops and set aside. Lower the heat to medium. In the remaining oil, sauté the shallot and garlic with red pepper flakes and salt and pepper. I like mine spicy, so I use a lot of red pepper flakes. When the garlic is golden, deglaze with the wine. A sauvignon blanc works great for this. Add in the tomatoes. When the sauce begins to reduce, add in the shrimp and cover. Keep an eye on the shrimp. They will cook really fast. Flip the shrimp about halfway through. You'll know to flip them, when the pink color starts to creep up the sides. After you flip the shrimp, add the clams and scallops in, and cover. When the clams open, the sauce is done, and you're ready to eat! I served this with linguine, but a spaghetti or angel hair would work as well. A fresh pasta would work great too. Sprinkle some fresh chopped parsley on top. This would also pair well with some cheesy garlic bread! **A note about the seafood. I made this dish just for me. I used five shrimp, four clams, and three scallops. Depending on how many people you are cooking for, you would need to increase the amount of seafood. Use these numbers as a guide.